Our Investment Property Tax Depreciation Schedule Report is prepared by fully ATO licenced Quantity Surveyors from our premier partner DK Property professionals, and the Report is 100% tax deductable! * A breakdown of building allowance deduction (capital works deduction) (division 43). * A breakdown of plant and equipment deduction (division 40). * The rates at which you can claim different items and the effective lifespan of each item. * A breakdown of how much you can claim per annum based on the financial year end. Our report will break down your plant and equipment depreciation by two methods: the diminishing value method and the prime cost method, which give you different options for claiming depreciation on your assets depending on your needs. Our self-complete/online (which means no site visit) Tax Depreciation Schedule Report for residential property is priced from $190 plus GST. 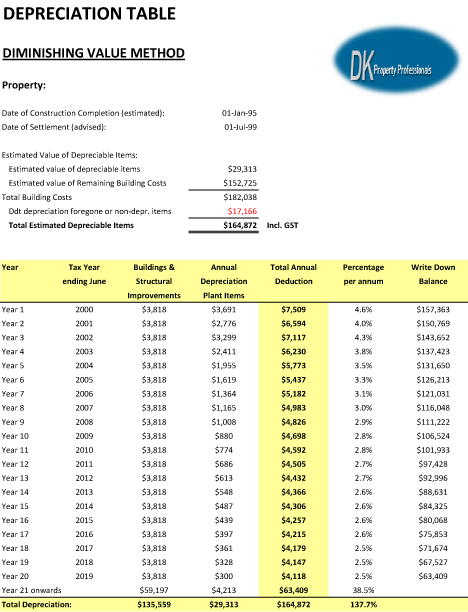 If a full site inspection is needed the price for residential property tax depreciation schedule report is from $400 plus GST. For a free, no obligation quotation please fill in the form below and then click on the "Get Quote" button. Our premier partner DK Property professionals will get back to you. Please fill in all the fields. We will beat any competitor’s written quotation. This field is required. We want to be able to address you properly. This field is required. We won't share your mobile with others. Please make sure you enter the correct mobile number. This field is required. We won't share your email with others. Please make sure you enter the correct email. This field is required. Please show us that you are in fact a human. If you want to know what exactly a Tax Depreciation Schedule Report looks like, please click on any of the images below to download a Sample Tax Depreciation Schedule Report in PDF format. DK Property Professionals (DKPP) prepare, sign, distribute, guarantee, and provide support to the Investment Property Tax Depreciation Schedule Report. Investment Property Calculator does not prepare, sign, distribute, guarantee, or provide support to the Investment Property Tax Depreciation Schedule Report. DK Property Professionals (DKPP) is a specialist in depreciation allowances for investment properties, providing Tax Depreciation Reports for owners of residential, commercial and industrial properties. Servicing all of Australia’s cities and states, DKPP can assist in effectively maximising tax benefits. Also known as building write-off, this is a deduction available for the structural element of a building including fixed irremovable assets. Residential properties built after the 15th September 1987 are eligible to claim this deduction of 2.5% over the Australian Tax Office (ATO) specified life of the property – 40 years. The plant and equipment depreciation deductions are available for removable assets. Plant and equipment assets are identified through ATO legislation as assets which have a limited effective life and can reasonably be expected to decline in value over the time they’re used. The ATO allows the use of two different methods to calculate deductions for Depreciating Assets in a residential investment property. The Prime Cost method assumes assets depreciate in value in a straight line (the same deduction each financial year), while the Diminishing Value method assumes assets depreciate faster in the short term, and progressively less. Both methods are based on the Effective Life of an asset and both claim the same total value over 40 years. The Diminishing Value method tends to be the most popular since it can achieve higher short-term deductions, thus maximising the benefit where an investor sells a property before the Effective Life of Depreciating Assets has expired. Please note: You can’t switch between methods of depreciation so it’s always best to consult with your Accountant or Financial Advisor to work out the best method to suit your investment strategy. 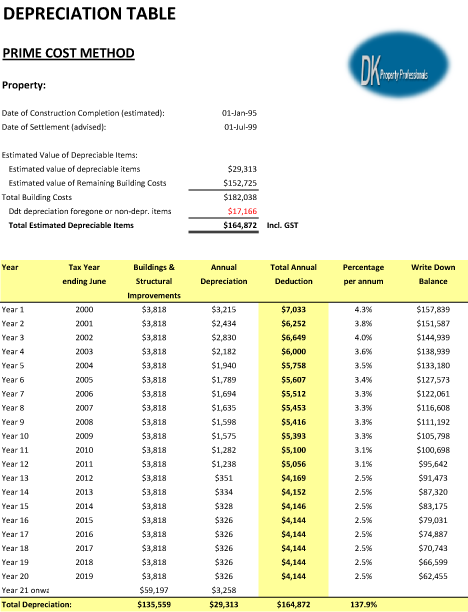 You should purchase a property depreciation schedule report as soon as you settle on an investment property. Doing it immediately after settlement will provide the most accurate values and reduce disruptions for any tenants that may be moving in. You should also get a depreciation report before and after any scheduled renovations on income-producing properties, as these renovations can provide significant tax deductions.